One of the benefits of this product is improved energy level. * When the immune system is functioning properly, it protects the rest of the body. When the body is protected, it is able to function at a higher capacity because it is unhindered by the interference of pathogens. The unique design of this product reflects 4Life’s commitment to innovation in its products’ ingredients and manufacturing. We at 4Lifecenter are proud to offer our customers the best products with the best ingredients. We hope you have a good experience shopping with us as we pride ourselves in our customer service and efficiency. If you require any assistance with our products, feel free to call us at 800.852.7700. You can also contact us by email at 4lifecenter@gmail.com. 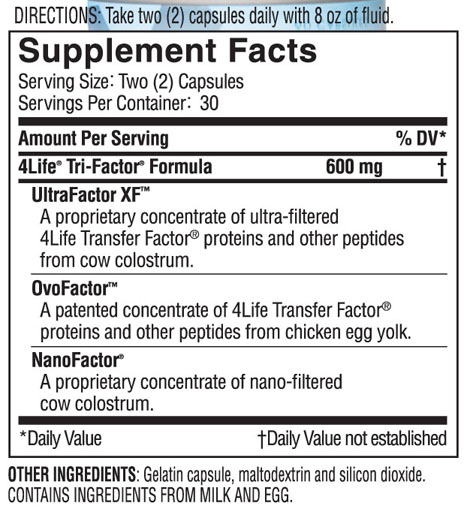 Click the button below to add the 4Life - Transfer Factor Tri-Factor- Free Shipping No Tax.. to your wish list.